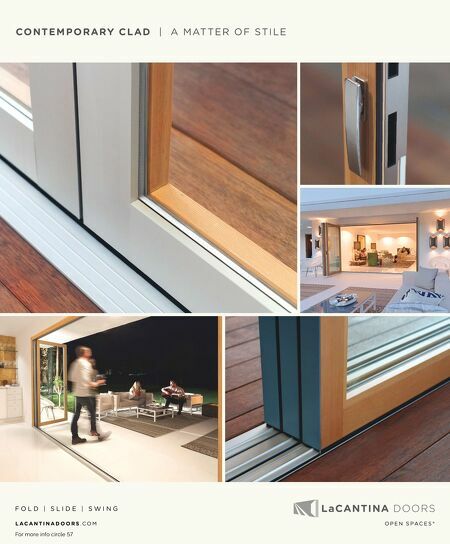 Combs believes the NARI Accreditation will "provide us with further brand awareness in our local market. We're accredited by our industry association. Why would you hire someone who is not?" ADVICE TO CONTRACTORS Combs also provides some advice to com- panies thinking about or already pursuing company accreditation: "Designate a key employee as a project champion who will oversee the process, delegate compliance tasks to individual team members, and as- sure quality completion of each compliance item." He also knows how intimidating the accreditation process can be and says, "Don't be discouraged because of how daunting the task can seem. Break it down into chapters and tackle it in steps." WHAT ACCREDITATION MEANS FOR THE REMODELING INDUSTRY Ultimately, Combs views NARI Accreditation as an important program to improve the pro- fessionalism and perception of the remodel- ing industry. "ere are, unfortunately, many contractors who are uninsured, unlicensed and unqualified. Accreditation will elevate our industry's professionalism and help clients identify professional contractors." He assures contractors who are considering accreditation, "NARI Accreditation will be a big component in acquiring higher-end and more profitable projects with clients who value quality over price." To those already pursuing accreditation, he adds, "You've made a good choice in running your business with integ- rity and professionalism, and validating this dedication to excellence by pursuing NARI Accreditation." | process. e accreditation standard address- es key business components every reputable remodeling company should have in place: ethics; business and financial operations; marketing and sales; quality compliance and training; and production and field operations. THE ROAD TO ACCREDITATION "It was an eight-month preparation process as we looked at our finances, job costing, quality control, subcontractor management, etc., all while continuing normal business operations and taking care of our clients," Combs notes. He views the work he and his team put into accreditation as an important investment in his company, not just from a marketing per- spective, but operationally as well. "While in many cases the process reaffirmed what we were already doing operationally, it was an educational and informative experi- ence that forced us to address components of the business we had either not fully developed or found were lacking. Accreditation gave us the opportunity to improve and fine-tune those processes for increased operational ef- ficiency and effectiveness," he says. Months of preparation led to official sub- mission of the accreditation application, along with proof of the company's business practices, processes and procedures. en, after a com- prehensive review by the NARI Accreditation Board, George W. Combs, Inc., achieved ac- creditation by NARI's Accredited Remodeling Company program in January 2018. PROMOTING ACCREDITATION Since achieving accreditation, the George W. Combs, Inc., marketing and sales teams have gone to work to make sure their pro- spective clients are aware of the company's accreditation and assure them that they are working with a competent and professional remodeling contractor. Carolyn Walkin, the company's marketing director, notes, "We recently created a new marketing piece for business development, and acknowledgement of our accreditation is a big part of this piece." early three decades ago, in 1990, George Combs established his residential remodeling business, George W. Combs, Inc., head- quartered in Huntington, New York, on the principles of professionalism, integrity and highly structured business processes. His adherence to these values has enabled him to position his business as a high-end renova- tion company, catering to projects throughout Long Island. [e average value of a remod- eling project George W. Combs, Inc., now takes on is somewhere between $1 million and $3 million.] In his continued commitment to the tenets upon which he built the business, Combs joined the National Association of the Remodeling Industry (NARI) in 2014, and sought to boost his professionalism and validate his expertise as a remodeling profes- sional by achieving his Certified Remodeler (CR) certification in January 2016. DISCOVERING NARI ACCREDITATION By the time NARI launched the Accredited Remodeling Company program in 2017, Combs was already familiar with how a reputable certification elevates current and prospective clients' perception of a remod- eling professional. He was excited for the opportunity to apply these same benefits to the entirety of his company by working to achieve accreditation. "I am always trying to set myself apart in business, which is a daunting task because everyone is so focused on price," Combs says. "When I heard about NARI Accreditation, I immediately identified it as a way to prove to my prospective customers that what we say in our marketing collateral and sales presen- tations is backed by the strictest standards of professionalism and solid business operations, as verified by an independent third party— our industry association." 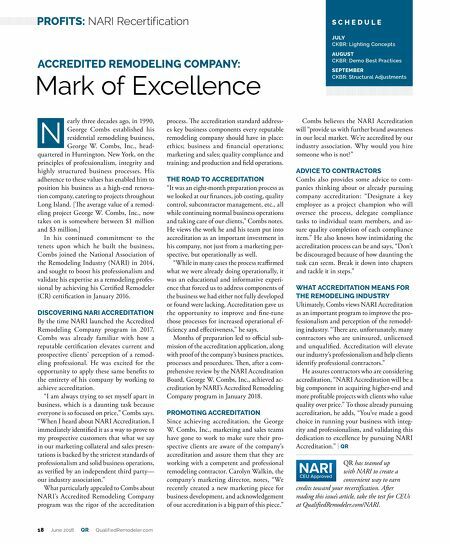 What particularly appealed to Combs about NARI's Accredited Remodeling Company program was the rigor of the accreditation N ACCREDITED REMODELING COMPANY: Mark of Excellence S C H E D U L E JULY CKBR: Lighting Concepts AUGUST CKBR: Demo Best Practices SEPTEMBER CKBR: Structural Adjustments 18 June 2018 QR QualifiedRemodeler.com PROFITS: NARI Recertification QR has teamed up with NARI to create a convenient way to earn credits toward your recertification. After reading this issue's article, take the test for CEUs at QualifiedRemodeler.com/NARI.